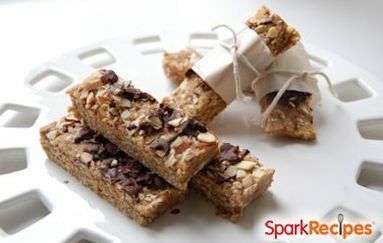 Swap out almonds with chopped cherries or dates for a fruity bar. Some vanilla flavored protein powders have a strong after taste. If yours does, choose an unflavored variety. Line a 5" x 8" loaf pan with wax paper. Place 1 cup of the oats in a food processor and pulse until they become flour. In a medium mixing bowl, stir together the oat flour, remaining oats, protein powder, peanut butter, flax seeds, dry milk, vanilla, and 1/4 cup warm water just until the ingredients are incorporated. Transfer the mixture to the prepared loaf pan. Using the wax paper, press down firmly on the mixture until it forms a loaf shape. In a small skillet, toast the almonds over low heat until fragrant and lightly toasted, then remove from the pan and chop. Remove the pan from the heat and add the chocolate to melt it, stirring often. Press the chopped almonds into the top of the loaf, then pour the chocolate over the almonds. Place the bars in the freezer for 10 minutes. Using the wax paper, lift the bars from the pan and slice into 6 bars. Wrap each bar in wax paper then in a sealed bag, and store in the refrigerator for up to seven days or freeze for up to three months.